Back-to-school season is coming quickly, and when it does you will have new expenses. Unless your kids are going off to college, or you’re sending them to private schools, it is likely that buying back-to-school clothes will be your biggest single expense. But there are ways to keep that expense down to a minimum. One of the best ways to save on back-to-school clothes shopping is also one of the easiest. Before doing any clothes shopping for your children, first take a complete inventory of what they have available from last year. The more that you can salvage from last year’s wardrobe, the less money you will need to spend on anything new. This usually works out well too – like the rest of us, kids usually have a short list of favorite clothes. Whatever they have from last year that they really like, they will probably be quite comfortable wearing in the new school year as well. Is there another family either in your extended family or your social circle that has kids that are about the same age as yours? We had a successful swap arrangement with another couple. Their daughter was two years older than our daughter, and our son was two years older than their son. This set the stage for handing down clothes from the oldest down to the youngest. Maybe this something you can work out as well? There are a lot of low-priced and gently used clothing items at thrift stores. In addition to the fact that they’re inexpensive, young children tend to burn through clothing very quickly. This is especially true for very young children – either they outgrow them, or they just wear them out through rough play. Having a source of inexpensive replacement clothing is a major cost advantage, and that’s what thrift stores can do. You can waste a lot of money buying designer clothes at top department stores, and your children will go through those clothes just as quickly as they will with lower-priced alternatives. While it’s true that kids become very label conscious in their high school years, you can usually get by with less expensive clothing from discount stores when they are younger. It could mean the difference between paying $30 for a pair blue jeans at Macy’s, or paying $12 at Walmart. 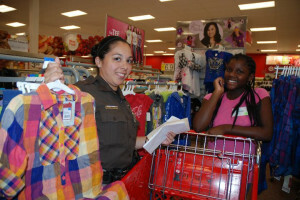 Stay with the lower-priced discount stores, especially for young children, and even more if you have several children. This is especially important if you need to buy clothes in volume, and that usually is what happens when starting a new school year. Rather than going to your favorite clothing store, instead try the ones that are offering the biggest sales. This can be an even bigger advantage if it is a lower-priced store with big discounts. Once again, it’s important to remember that kids just don’t stay in their clothes very long. When shopping for your children’s clothes, before heading out first check out the websites to see if they have any coupons. Not only will this give you an opportunity to save money, but it will also give you a first-hand glimpse at their sales and specials. The stores will often offer a flat amount off or a percentage discount on purchases over a certain dollar amount. For example, they may offer a 25% discount or $25 off on purchases over $100. If you know this before you go, you’ll be able to buy enough at that specific store to take advantage of the discount. These can be a good place to buy better quality brand clothing. And since kids go through their clothes so fast, it’s not hard to find a large supply of them in a consignment shop. The stores are more expensive than thrift shops, but again the quality is better. The fact that the quality is better is usually the whole reason why the clothes and being sold at consignment shops, rather than at thrift stores. Consignment shops offer the seller an opportunity to make some money on the clothing, while clothes turned in at thrift stores are donations and provide no revenue to the seller. This is something that my wife and I discovered to be a big advantage. The big crush for back-to-school clothing happens before school starts. Sure, a lot of the stores have sales, but it’s hard to escape the idea that they raise their prices substantially before announcing those sales. If you wait until a couple of weeks after school starts, you’ll generally be able to get better deals on kids clothing, if only because the heavy traffic will have passed. And speaking of heavy traffic, there’ll be a lot less of it if you wait until after school starts to go shopping. Buy the minimum amount of clothing that you need to get through the first week of school, but save the bulk of your buying until afterwards. And one more advantage here: if you wait until after school starts to buy most of the clothing, both you and your children will have a better idea what the styles are for the new year. What strategies do you use to keep the cost of back-to-school clothing as low as possible?